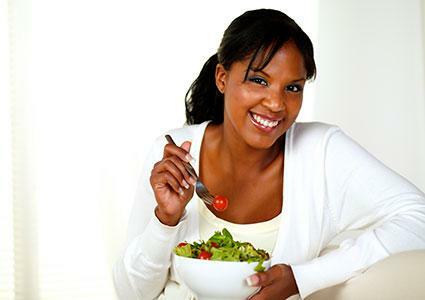 Many people with diabetes believe they need to follow a special diet in order to be healthy. According to the American Diabetes Association (ADA), however, people with diabetes can eat foods similar to people without, as long as they follow some simple guidelines. A 1,200 calorie diet using these guidelines is a low-calorie diet that may help you lose weight. The ADA takes an approach similar to the MyPlate system. Instead of measuring portion sizes, the ADA recommends dividing your plate into three sections. Imagine a line right down the middle of your plate. Fill one full side of the line with non-starchy vegetables such as broccoli, green beans, or leafy greens. On the other side of the plate, imagine a line down the middle, dividing it into two small sections. Fill one of these smaller parts with a starch such as potatoes, bread, or brown rice. Fill the other part with meat, fish, poultry, or other lean proteins. Add an 8 ounces of lowfat dairy or another small portion of carbs. Add a small piece of fruit. This meal plan is based on the ADA recommendations, and adds up to around 1,200 calories per day. It is not endorsed or created by the ADA. To follow the meal plans, select one each from breakfast, lunch, dinner, and snack to total around 1,200 calories per day. Each of the following breakfasts has around 300 calories. Whisk together 3 egg whites. Spray a saute pan with nonstick. Cook 1 cup of spinach and 8 sliced button mushrooms in pan until softened. Pour egg whites over vegetables. Allow to cook until set. Spread with 1/4 avocado mashed with a squeeze of lemon juice. Add one slice Canadian bacon and a poached egg. Spray a nonstick pan with cooking spray. Over medium heat, saute 1/2 chopped onion and 1 cup chopped zucchini until soft. Add 3 egg whites, whisked together, to the pan and scramble together. Add 1/4 cup salsa and cook until warmed through. Put egg mixture on top of a warmed 6" whole wheat tortilla. Sprinkle with one ounce fat-free cheese. Scoop a few spoonfuls from the center of the avocado to make the hole large enough to accommodate an egg. Crack the egg into a ramekin and carefully transfer it to the avocado. Bake at 425 for 15 to 20 minutes. Top with shredded cheddar and broil until cheese melts. Each lunch is around 400 calories. Combine 1 cup spinach, 1 cup arugula, and 1 cup romaine lettuce. Add 2 ounces of chopped roasted skinless chicken breast and one chopped hard-boiled egg. Add 5 cherry tomatoes, halved, 1 sliced carrot, and 1 sliced cucumber. Add 1/4 cup cooked quinoa. Toss and top with 4 tablespoons fat-free ranch dressing. Dip vegetable slices and pita chips in hummus. Top yogurt with sliced peaches. Layout six large pieces of kale. Top with six slices deli turkey. Mix six tablespoons of cream cheese with one teaspoon of horseradish and spread on top of each of the turkey slices. Place 1 cherry tomato, halved and 3 or 4 pieces of baby spinach on top of the cheese. Roll each piece of kale into a roll. Add 3 ounces turkey-ham, 1/4 cup chopped spinach, 5 sliced cherry tomatoes, and 1/2 cup spicy sprouts. Each of these dinners is around 400 calories. Combine sriracha and yogurt before topping potato. Select three large pieces of romaine lettuce. Roast 3 ounces of skinless chicken breast. Toss with 2 tablespoons soy sauce mixed with 1/4 teaspoon grated ginger. Steam 1/4 cup brown rice. Chop four scallions and julienne 1 large peeled carrot. Divide chicken, vegetables, and rice among three lettuce leaves. Top with 1/2 cup bean sprouts, divided evenly, and roll like a burrito. As you eat it, use 3 tablespoons sweet chili sauce as a dip. Heat one tablespoon olive oil in a pan. Add 1 red pepper, chopped, and 1/2 onion, chopped. Add 1/2 cup cooked couscous. Heat 1/2 tablespoon of olive oil in a pan. Saute 1/2 onion, sliced, and 1/2 cup mushrooms, sliced. Season to taste with salt and pepper. Top with a 3 ounce patty made from 93 percent lean ground beef, and 1 slice fat free cheddar. Top hamburger with onions and mushrooms. Top potato with fat-free cheddar and plain yogurt. Season with salt and pepper. Choose one 100-calorie snack per day. Remove rind from one 1/4 inch wedge of honeydew melon and cut in half. Wrap each wedge with one thin slice of deli ham. Dip jicama slices in salsa. One of the best ways to manage your diabetes is by eating a variety of healthy foods, with vegetables making up the bulk of the foods you eat. Always talk to your doctor before starting a new diet. By eating according to ADA guidelines and limiting calories to 1200, you may be able to lose weight while managing your diabetes.